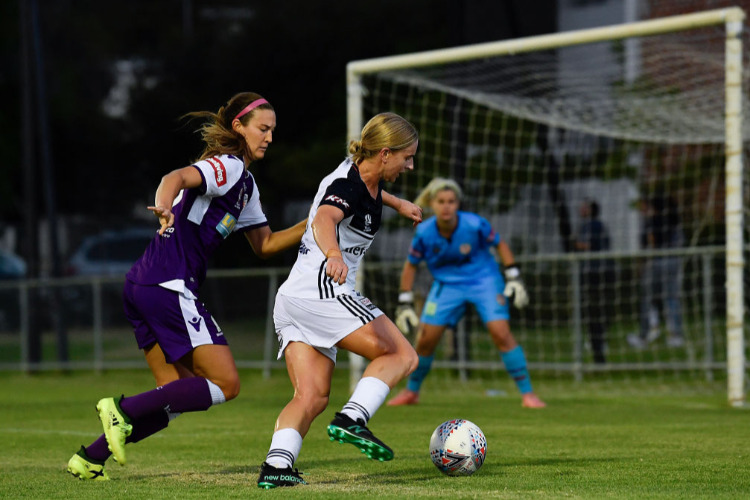 Melbourne Victory captain Natasha Dowie says the club's W-League finals campaign will be two of the biggest weeks in the lives of her players. W-League premiers Melbourne Victory savour the calm in the middle of "two of the biggest weeks of our lives" when they travel to Canberra United for a catch-up game on Tuesday night. Coach Jeff Hopkins will rest his stars and give fringe players a chance to try out for Sunday's semi-final squad. Victory's 2-1 defeat of Perth Glory last Friday night secured the club's first premiership and set up a return fixture against Sam Kerr's side on Sunday afternoon at AAMI Park. But before that clash comes a trip to the capital to face United in a match postponed from last month due to lightning strikes. Star midfielder Christine Nairn, one of the favourites for the Julie Dolan Medal, and fellow American Dani Weatherholt will be spared, while Sam Johnson is also suspended. Captain and star Natasha Dowie has her hand up though, saying Victory had re-framed the match as a reward for effort. "Some players have trained all year but haven't got the game time they've wanted or deserved," she said. "Those players have been huge to our success and keeping spirits high. "Myself, I always want to play in every single game. I'm going to leave it down to Jeff. "But I'll be travelling no matter what. I'm not going to miss getting my hands on that trophy." Given Victory finished seventh last year and were wooden spooners for the two previous seasons, it's remarkable they could finish six points clear on top by defeating United. Dowie, an England international who last claimed team success in the 2014 Women's Super League, said she needed to be reminded that winning the premiers plate wasn't the main game. "I haven't been in that situation for a long time, since winning the league at Liverpool," she said. "There were a few nerves, in Perth it was like 'Oh my god we can actually do this'. "But we didn't celebrate how I might have liked. Coming from England ... winning the league, the teams that wins week in, week out is the big achievement. "We enjoyed ourselves on the bus trip back to the hotel but then Jeff was on at us to get our recovery happening. "No one here remembers who won the premiership, they remember who won the championship - which was City, not (premiers) Brisbane last year. "We've got three more games to play ... we've got to get our heads down now. They're two of he biggest weeks of our lives."